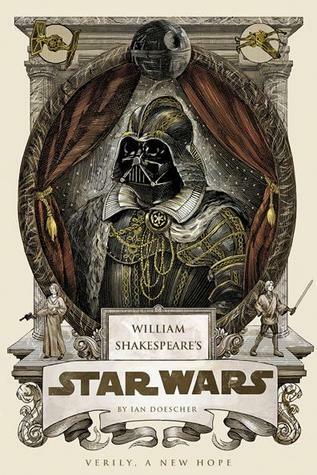 Yes, “William Shakespeare’s Star Wars” is precisely what the title implies, and it is exquisite. Author Ian Doescher has taken the familiar story of the original “Star Wars,” and has somehow translated it into lovely Shakespearean language. Scenery changes and background information are provided by a Chorus, just like Shakespeare, but the dialogue carries this book. My favorite is R2-D2. Everyone else will be thou-ing and prithee-ing, and R2 will chime in, “Beep, beep, brap, wheee, doop,” or something like that. Better still, as in so many of Shakespeare’s plays, characters speak to the audience in asides. So does R2. His aside might be, “Lo, if this golden droid, C3PO shuts not his mouth, verily shall I zap him into oblivion.” Then, his aside over, it’s back to the beeps. I’ve seen this film so many times that imagining the characters and action was not an issue for me. I’m not sure how easily a Star Wars newbie would be able to follow the story. Seriously, though: who hasn’t seen Star Wars? There are a couple traps Doescher deftly avoids. His language never wavers—it would be too easy to start this project in devout homage to Shakespeare, then to slack off as the book got on. He didn’t do this at all. The other danger would be in making either the individual scenes too long, or overwriting the book. He did not do that either. So much of Star Wars’ dialogue was overly theatrical anyway. Shakespeareanization was a brilliant next step. Ian Doescher has taken one of our planet’s most beloved stories and given it a truly fresh twist. He is to be commended. How rare that one can say, “Both Obi-Wan Kenobi and William Shakespeare would love this book.” They would.